Mechanics' institutes were public organisations which promoted adult learning amongst working-class people. The library was at the centre of every institute. 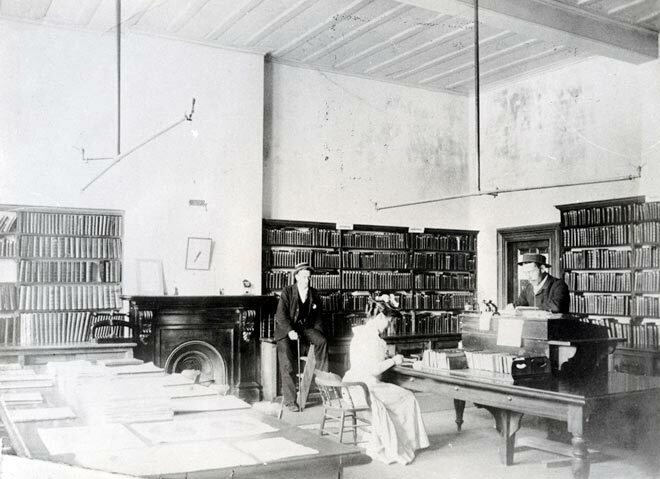 This is a rare photograph of a 19th-century library interior, in this case the Timaru Mechanics' Institute library. The man standing next to the fireplace is clearly posed, perhaps contemplating how he should spend his time in the library. Large volumes, possibly including newspapers, are spread out on the table at the left. The library looks austere, suggesting a sober place of learning.